Boston Loves Paris: First Snow & A Birthday! Last night Angela picked up Guillaume after work because the first snow fell during the evening, and he couldn't scoot around on La Voile. 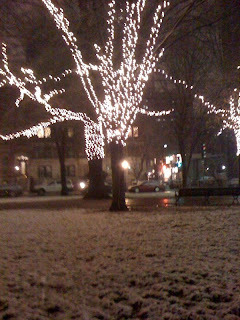 The seasonal lights are up on Commonwealth Ave, and it was so pretty with the snow. And now it's time for spring!